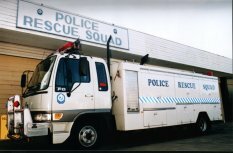 The Wollongong Police Rescue Squad is attached to the South Eastern Region and is based in the Wollongong Local Area Command. This Rescue Unit has an authorised strength of 15 operatives. There are two full time rescue operatives and 13 part-time rescue operatives. The Wollongong Police Rescue Squad has been certified by the State Rescue Board and has been accredited by the Minister to participate in Rescue operations as a primary general land based and vertical rescue unit. The Wollongong Rescue Squad has a joint primary rescue accreditation with the Wollongong Ambulance rescue unit covering the area north to Helensburgh and south to Minnamurra River, Minnamurra, this is approximately 46 kilometres in length. The Rescue Squad at Wollongong has the only Vertical Accreditation for vertical rescue in the Wollongong and Shellharbour Local Government areas. Rescue 70 (Hino Diesel truck) main rescue vehicle. Rescue 71 (Toyota 4wd) back up to rescue vehicle. South East 300 (Leyland Omni Bus) Mobile Police/Rescue Command Post Bus. Rescuing people trapped in difficult high or deep places such as mines, storm water drains, cliffs, scaffolding and remote places. Rescuing people involved in industrial, traffic, railway and aircraft accidents or who may become trapped in household, machinery or playground equipment. Providing power or lighting in emergencies or Police operations such as sieges, searches, disasters and rescues etc. Rescuing livestock and domestic animals/pets in accidents. Conducting Bush search operations for lost, missing people or overdue bushwalkers. Working in Toxic and Hazardous environments. Providing specialised support to State Protection Services Unit (OSG and SPSU) while performing duty at high risk incidents. Respond to Bomb threats or incidents with accredited Bomb Appraisal technicians for suspect objects or packages. The Wollongong Police Rescue Unit has two accredited Bomb Appraisal Technicians to respond to any Bomb Threat incidents within the Command.